Well it’s been a couple of days since I’ve been here. Had to make a trip up to Mountain Home, Arkansas. Our daughter had a job interview. Christina is about six weeks away from graduating from vet school. Now it is job hunting time. We are so proud of her accomplishments. Now it is time for her to be able to put all the years of learning to use. Of course it will be awesome for us to have a vet in the family! Mountain Home was wonderful. We stayed at Old Ferry Road Bed and Breakfast, I would highly recommend it if you are ever in the area. Each room has a custom theme and the attention to detail is more than expected. The linens on the bed were Egyptian cotton, the towels plush, the amenities amazing. If you want a mouth watering breakfast, this is the place for you. We were treated to a fresh fruit and yogurt parfait, complete with star fruit and Greek yogurt , followed by Belgian waffles,complete with pecan sauce, and accompanied by bacon. We also had fresh orange juice Cafe Dumond coffee with chicory. All of this was topped of with a sumptuous lemon loaf drizzled with blueberry sauce. It was a very memorable experience for us both. While in Mountain Home, take the short drive to Lakeview and have dinner at Club 178, well worth the drive. The atmosphere is sophisticated, yet relaxed. I had Amy’s Chicken. It is a breast seared, then covered with spinach, goat cheese, and basil cream sauce. It was mouthwatering. Christina had London Broil, which was prepared to perfection. The salads were fresh and dressings perfect. Only regret, no room for dessert. Another place that is a must see in Mountain Home is the Farm Store! I spent quite some time in there while Christina had her interview. It is like TSC and the Conway Farm Store together. For me, it’s like a candy store! Update, our little Twisted Sister is doing much better. We took her wrap off tonight and she seems to be about 90% healed. Will check in tomorrow with more. Why all the goats? Why so much work? Update: Our new little girl kid has made a wonderful improvement. Last evening she was up on her leg, trying to put pressure on it. This morning she is putting pressure on it, her ankle is better and we are hopeful. We put all this work and care into our goats so they will be healthy and produce lots of milk. Lots of milk, means lots of product. We are a small farm and a small business. We are selling our milk and cheese and we are making goat’s milk soap and lotion. In order to create the quality product, we must have quality goats and therefore we must give the best possible care and feed. The response from our community has been awesome. It is an awesome adventure. Our little girl "Twisted Sister"
You know it always happens when it’s cold and wet, and nobody’s home! Birthing that is. We keep pretty good records of our breeding procedures, so we try to plan birthing when it is convenient for us and we can be there. However Mother Nature has a way of laughing at your plans. Our first set of twins this year came right on time, we planned them for spring break, so we could “help” the momma’s out. On the last day of school, just as I got home, we had birth. Zoe is a first time momma, she was pretty scared. We were hoping that the veteran moms would help her out and show her the ropes. As we observed from a safe distance, it was noted that she was handling the little doe well, but was not working with the buck. She would pick him up by the tail and fling him away. Amazingly, Hershey the llama would have no part of this. Hershey is a jewel, he took the little guy under his wing, or in this case under his belly and protected him. It quickly became an issue of feeding, Hershey could not complete this task. As per usual, we have a kid in need of three a day bottle feedings. Each year we foolishly believe that we will have all mommas feeding and caring for all babies. And each year we end up with at least one baby on the bottle. So this is our bottle baby this year. Yesterday was a cold and rainy day, so it only makes sense that Ellie Mae should deliver. As I arrived home and did my usual check of the herd, I noticed there were two new babies. We had another set of twins! The first born was up and teetering on her wobbly legs. The second was not as strong at this point, she was still wet from birth. Our little girl was sitting in the rain and shivering. 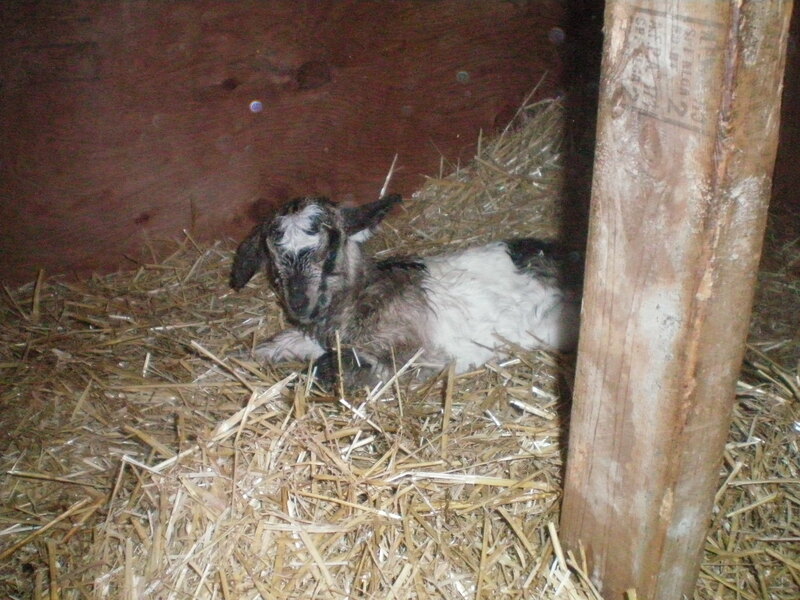 Quickly I scooped her up and got her in one of the houses into some dry straw. Upon closer inspection, it became apparent that her back leg was not operating properly if at all. As I checked her over it seemed all of the bones were intact, but her back leg was bending in the wrong direction at the knee and ankle. The first order of business was to make sure she would eat, then we could deal with the leg. For about the next hour I sat with our new family unit to make that the mechanics of eating and cleaning were working between mother and daughters. Once that was satisfied, we had to deal with the leg. My husband and I got her up and worked the leg around. It did not seem broken just not right. We decided to wrap it to stabilize the leg. Now what to do in the long run. Ok, our little girls need colostrum, THE most important thing, and they need rest. We decided to let them rest and recheck in a couple of hours. Upon the late evening check, she has a full belly and is resting comfortably. Fast forward this morning, our little precious is up on three strong legs, eating and adorable. We are checking with our vet to see the next step. Moving to the country, that was the dream. We lived in town, but had veggie gardens and fruit trees. We also had dogs,cats,bees, a bunny and chickens. All was fine until our sixth chicken accidentally turned out to be a rooster. I do believe that was the last straw for our city friends. We began the search for our farm. We actually found it quickly, when we pulled up in the drive and I saw this adorable ranch home with a front porch that ran the full length of the home, three ceiling fans, a porch swing, and the big tree ringed with iris in full bloom, I was sold. The home has a big country kitchen, large open living room with stone fireplace, a great master suite, two additional bedrooms and an additional bath. On the ten acre property are lots and lots of trees. It had a couple of outbuildings and some fencing. The farm was a real charmer. We made an immediate decision to buy that farm. At this point we believed our mission was to just live a simpler life and become a bit more self sufficient. Little did we know that our life as we knew it would disappear and would be replaced by the most fulfilling adventure we have ever been on. It was our intent to increase our chicken flock and make them self supporting. We built them a nice nice new home and run that was protected in every way. Once this was done we purchased a few more chickens. Since then we have increased the flock several times and due to a tragic fire, we have rebuilt the coop. ( That is a story for another time.) We have about thirty five laying hens right now and just received thirty more peeps from a hatchery. For now, they have taken up residency in the milking house. They are at the point where they are losing the fluff and getting their real feathers. We are on the twice a day feeding and cleaning routine. But they sure are cute! They are so young they do not even know that they cannot fly. It is really funny to watch them spread their wings and try to fly, only to land on the ground severely disappointed. We haven’t told the big girls yet that they are getting new house mates. It is a comical day when the new chicks are introduced to the older hens. Some of the older ones are kind and take care of them, some ignore the young ones, and some are kind of mean, they pick on the little ones and push them around. But, after a few days it is like one big happy family. My girls are indeed earning their keep, they are laying enough eggs to pay for their feed, that alone would be enough to make them a blessing. We are selling our eggs locally and are having a great response. But, we put our kitchen waste, our yard waste and all the horse waste in their yard, in turn the girls create the most wonderful compost. Each spring we remove it and we get enough to dress all the flower beds, fill all our pots, top off the vegetable garden, mulch the fruit trees, and plant several hundred heirloom vegetable plants we sell from our small greenhouse. After all that we still have plenty for family and friends. So the girls are definitely self supporting. When we started this, we never imagined that we could gain so much knowledge, income, and resources from our girls. More on our mission soon! We totally love the farm life. However, there are some days that are harder than others. Today is our first day back to work after spring break, it is cold and dreary, and we had to get up at 5:00, after sleeping in till 7:00 last week. It is spring, so we have lots of babies.Right now we have about thirty little peeps and a set of twin goats born last week. Our little doe is being cared for by her momma, but our little buck has been shunned by her, so he is being bottle fed. Which means at 5:30, in the cold predawn I was out there with a bottle. He is on the three bottles a day plan. It just warms your heart when he is drinking the bottle and that little tale is wagging to beat the band. He makes me smile. Once he is finished eating, it is off to the peeps. They are on the two a day cleaning plan. Boy can they make a mess overnight. They are just getting their real feathers. It is neat to watch them spread their wings and try to fly. Don’t they know chickens don’t fly? I guess that is part of the learning process. Two quarts of water and a quart of food overnight, really? They are fed watered and cleaned. While I am doing this, my husband handles the horses, the grown chickens and goats. Morning chores under control, off to the day job! Hello, we are a small farm in rural Arkansas. We have been living the farm life for about five and a half years. It is such a process, we learn all the time. It started with just five chickens while we still lived in the city.When we got the sixth chicken and he accidentally turned out to be a rooster, we knew it was time to move on. We now have thirty five layers, a couple of roosters and thirty peeps. The peeps flew in a couple of weeks ago, (on a plane,from a hatchery), and seem to double in size daily. Our chocolate lab, Joe, has really taken to them and crawls in the cage with them at cleaning time. I haven’t broken the news to the older girls yet that a new flock has arrived. They have taken up residence in the goat house for now. We are looking forward to the new girls eggs starting late this summer. At present we have fourteen dairy goats,two born last week, three angora goats, and a llama to protect them all. About a year after we bought the farm, our son decided we needed goats. 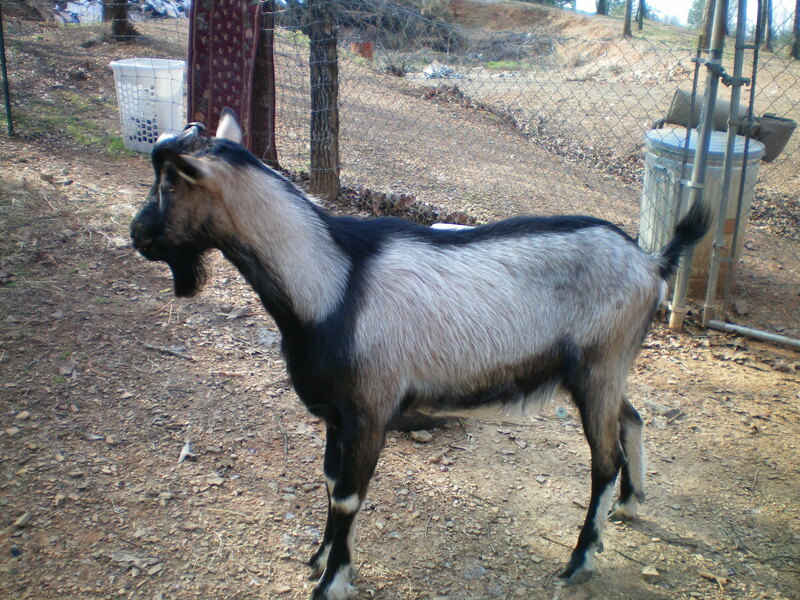 We had thought and talked about it, but our son is a man of action, so we got goats. He called us from the freeway, said he was on the way home, we could hear a strange noise in the background. When we asked him, he said he had a couple of kids with him. What a surprise for us. He arrived with two very small kids and a gallon of goat’s milk. No housing, no fences, no knowledge of dairy goats! 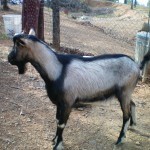 He had, however purchased high quality registered dairy goats to get us started. We spent the next couple of months taking shifts in the feeding routine. 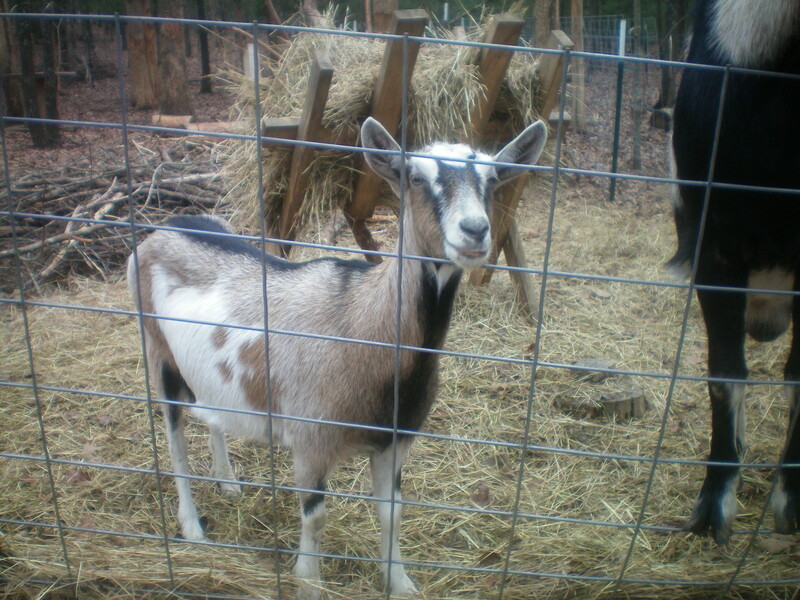 We bought books, fencing, made homes for them and found out that French Alpine Dairy Goats are the clowns of the goat world. They love to climb and jump are very inquisitive and will try to chew about anything. 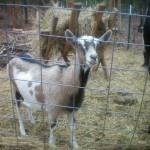 Our first goats, Bonnie and Clyde have done very well, they are the foundation of our herd. In spite of the mistakes we made, they have served and produced well. As our herd has grown, we realized we needed a guard animal for the goats. We started to do some research of the choices, herding dog, donkey, or a llama. I would not be good at leaving a dog outside when our other dogs get to come in at night. Donkey, hmmm, well too much noise and not the best personalities. A llama seemed to be the choice. So we started looking. Again our son, a man of action stepped up. We received a call he found a young llama. 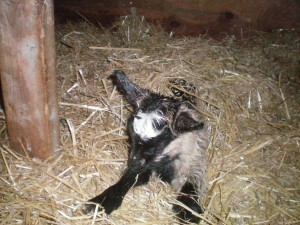 It was the end of January and we had just had a snow storm, but he would not be available for long, so off we went. It was cold, the roads were bad, and we had to haul a trailer to get him. Once we arrived at our destination, it was one look for love at first sight. We absolutely were drawn into those huge eyes. I caved and my husbanded smiled and said “Nothing says love like a llama. Happy Valentine’s Day.” His name is Hershey.